The Cable Rail System is great for both interior and exterior usage. While some love the classic, rustic wooden feel, others like the modern, futuristic look of the cable rail and stainless rail systems. The Cable Rail System comes in two forms: Outside-to-Outside and Inside-to-Inside. One method has the screws drilled directly into the wood or steel (Inside-to-Inside), and the other method has the connectors latched onto the opposite side of the wood/steel post (Outside-to-Outside). The Inside-to-Inside system comes with wood screws for a wood/cable combination. The Inside-To-Inside system comes with Stainless Steel screws for a steel/cable combination. The posts come pre-drilled for one-side-holed and two-sides-holed posts. The two-sides-holed stainless steel and galvanized steel posts are intermediate posts, which are situated between the anchoring one-side-holed posts. The Outside-to-Outside system comes with connectors that loop to the outside ends of the post. The difference between the two cable rail systems is mostly aesthetic. Both systems are easy to install and last a long time if installed properly. Make sure to find a contractor who is experienced with handling stainless steel parts. 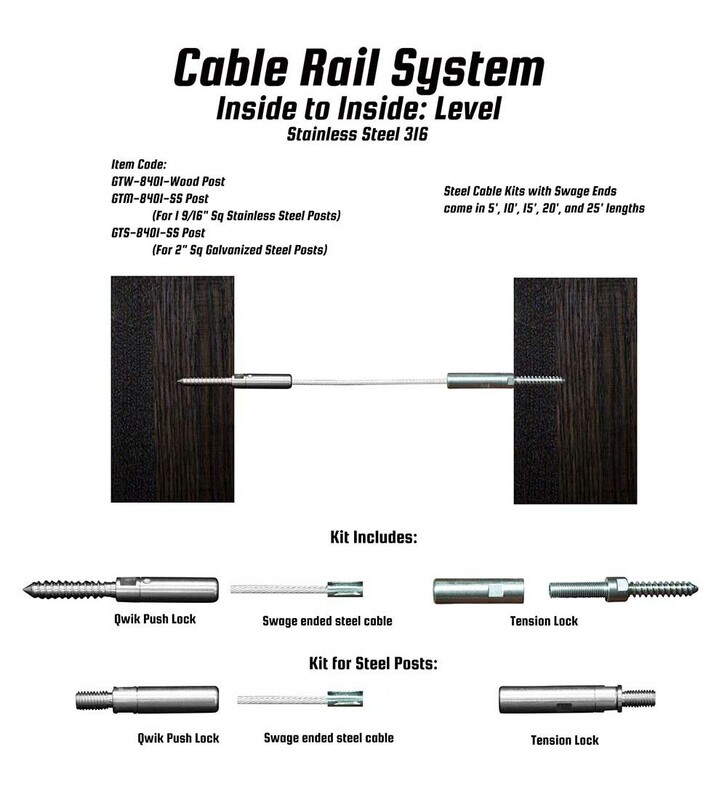 The cable rail systems come with pre-cut cables sized at 5’, 10’, 15’, 20’, and 25’. All parts of the cable rail system are purchased individually. Some customers prefer the discreet look of the Inside-to-Inside cable system, which showcases more of the raw wood or steel since the hardware is mostly engraved on the insides of the posts. Others like the large stainless steel circular connectors engraved on the outside of the posts of the Outside-to-Outside system, which, depending on the wood species, offers a variety of contrasting colors. All cable rail systems and posts can be used for outdoors. Not all wood species qualify for long term outdoor use. 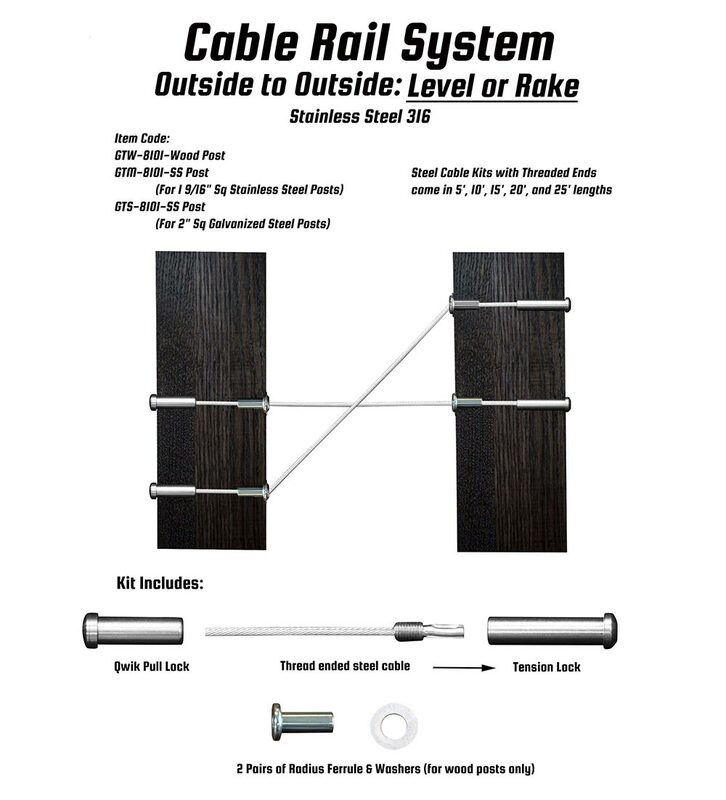 Research your wood preferences prior to purchasing a wooden cable rail system. There are two types of metal posts as anchor points for the cable rail system: 39” tall Stainless Steel & Galvanized Steel posts. The metal posts can be upgraded to outdoor grade (316 grade stainless steel). The posts can be ordered with a 3” tall saddle which are customized for level and rake handrails. The handrails can be wood or stainless steel with over ten species of woods and three types of steel. 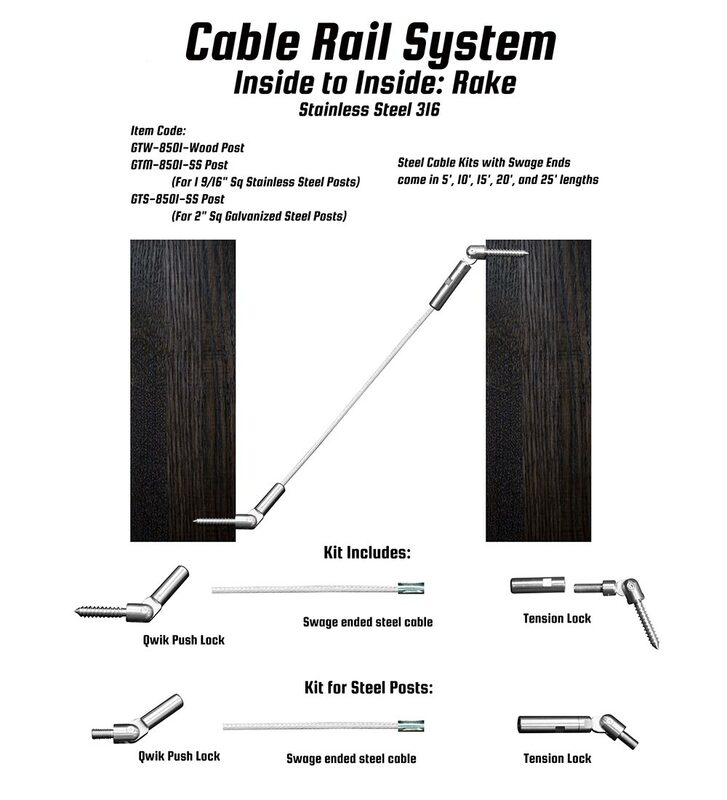 Species of wood that work well with the cable rail system include Red Oak, White Oak, European Beech, Hard Maple, Poplar, Alder, Walnut, Brazilian Cherry, American Cherry, and African Mahogany. The three different types of steel are 304 grade stainless steel (cheaper, for indoor usage), 316 grade stainless steel (more expensive, withstands the wear and tear of outdoor usage), and black galvanized steel (can be painted, great for both indoors and outdoors). The square stainless steel handrail is 2” thick, while the round stainless steel handrail is 1-11/16” thick. The 2” square galvanized steel post is primed in a black color (great for painting). The posts can be plain, or with holes drilled 4” apart along the sides of the stainless steel posts – either one or two sides of the posts can be drilled with these ⅜” holes, which house the cable rail system connectors. The 4” rule states that no 4” sphere can pass through the balustrade. In this case, the balustrade are the cables positioned parallel to the handrail. The 39” stainless steel post comes with eight holes spaced 4 inches apart. The holes are made to house the cable rail system connectors, which latch each cable to the stationary anchor posts. The cables can then be wound up and tightened using the push lock system. There are both square (1-½” and 1-15/16”) and round (1-11/16”) stainless steel posts. The black or primed square galvanized steel post comes in one size: 2”. The cables come in two thicknesses: ⅛” and ⅜”.